Key City Bike is run completely by volunteers. Sweeping, scrapping, hauling, fixing, organizing, inventory, teaching, bookkeeping, outreach, fundraising, providing customer service; you name it, at Key City Bike it’s done by a volunteer. Why volunteer at a community bike space? It’s an awesome way to give back to your community. You’ll learn about bikes; maintenance, mechanic skills, bike culture and safety. To gain experience in nonprofit work. To fulfill school or community service requirements. Do I have to volunteer to use the shop? Not at all! During open shop hours the shop is open to anyone who would like to use the space and tools to work on their own bike. How do I track hours? Once you have signed up at the shop to be a volunteer, you will log in using your telephone number and hours are tracked through our software program. Tracking volunteer hours helps Key City Bike obtain funding for grants. Volunteer hours can be reported to employers, schools, and probation officers. Some volunteers choose to participate in the Earn-a-Bike Program. In the Earn-a-Bike Program hours are exchanged for credits towards a refurbished bike. Key City Bike also offers a Volunteer Purchase Program, currently being revised. Details will be shared soon! The first time you volunteer, just show up! We will get you signed up and put you to work. If you are under the age of 14, you will need to have a parent sign a waiver and be present with you while you volunteer. If you are 14 – 17, you will need to bring a parent for your first time to meet our Lead Volunteer and to sign a waiver. 18+ need to sign a waiver before starting to volunteer. Volunteer Orientation takes place every Wednesday at 6:00pm. After that first time volunteering, you will use Signup.com to sign up. CLICK HERE TO SIGN UP. What if I can’t volunteer for the entire shift? General Volunteers can volunteer for any amount of time that works for them. Sign up through the link and leave a comment including the time frame you plan to volunteer. Sign up HERE. Greeter – greet people as they enter KCB, help new volunteers get registered in our system, assure volunteers get signed in, introduce volunteers to the Lead Volunteer in the shop, give tours of the shop and direct customers looking for parts and bikes to the “retail areas”, assist with office duties (filing waivers, organizing merchandise, general cleaning, etc). We need at least one greeter per shift. (Wednesdays 5:30-8:30pm, Saturdays 2:00 – 6:00pm). Sign up HERE. General Volunteers – assist with tasks assigned by the lead volunteer. These tasks are to keep the shop running but are also meant to empower people through learning about bikes. Tasks include scrapping, repairing retail bikes, cleaning bikes, organizing and labeling parts, etc. We need all the general volunteers we can get! (Wednesdays 5:30-8:30pm, Saturdays 2:00 – 6:00pm). Sign up HERE. Lead Volunteers – help manage and train general volunteers, assist with sales of used parts and bikes, assist community members with bicycle repairs, organizing the space (sorting tires, labeling parts, sorting bikes, etc), open and close the shop. Earn-a-Bike Lead Volunteer – help manage Earn-a-Bike (EAB) program participants: guide EAB participants through online registration, teach scrapping skills, tire changes, chain cleaning and lubrication, proper seat height, teach bike safety and rules of the road, maintain EAB folders with participants’ progress. FTW Lead Volunteers – Women, transgender, femme, two-spirited, non binary identifying volunteers to lead other FTW volunteers in bike repairs and camaraderie; assist with and teach bike mechanic skills, help with programming and events, open and close the shop. 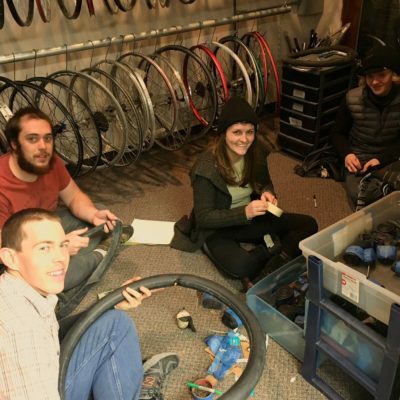 Build Night Volunteers – mechanically inclined volunteers to help repair and prep bikes for sale. We need all the volunteers we can get! (Mondays 8:30-11:00pm) No signup needed, just show up.